by PaulEMoz in "DC comics", "Mortal Kombat", "beat 'em up", "fatalities", "fighting"
Look at that title again. I don't know who the hell thought that was any kind of marriage for a fighting game. Obviously someone a bit mad. I reckon that was a tough sell to the DC Comics guys... "yeah, so Scorpion throws his harpoon into Superman's chest and reels him in like a fish, then uppercuts him twenty feet in the air before setting him on fire". They must have figured the kids would love it, because they went for it. I'm one of "the kids", although I've waited until it was dirt cheap before I bought it (surprise!). The thing is, Mortal Kombat has always been a bit of a guilty pleasure for me, right from the first game when I used to go to the Laser Quest underneath my workplace on a lunch break and play against my mate Neil Jackson. I never manage to figure out the majority of the moves or the fatalities, but the ones I do get are usually daft enough to put a big smile on my face. 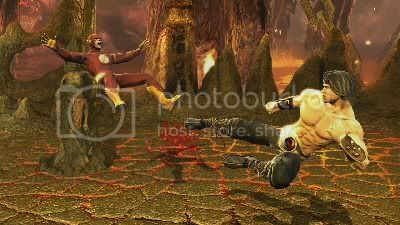 Liu Kang puts The Flash into the middle of next week. So what is it like, then, putting a harpoon into Superman's chest? Well, it's enjoyable, of course. It's actually good fun playing on either side, even if it is pretty simplistic as fighting games go. That works for me... I can never get my head around the complexities of Street Fighter or Virtua Fighter. Mortal Kombat gives me some entertaining button-mashing beat 'em up action that does the job just nicely at the right given time. I can't say I like the graphical style as much as the original, but everything looks fine. The fighting itself has some real weight to it, with these titans battering each other in very satisfying fashion. Slamming through walls or into the ground from a great height feels just as you'd expect it to, and when you're playing as Superman it's vaguely reminiscent of the classic fighting scene in the Superman II movie. Which is great, obviously. 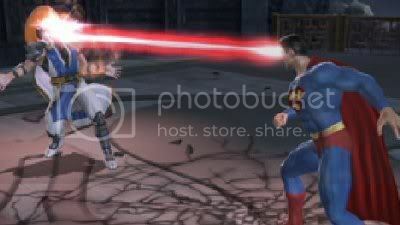 Supes shoots Raiden. THROUGH THE FACE! It's nowhere near as good as Street Fighter IV as a game, and yet after owning it for just three days I've already played it more. That's just me and my preferences... I'm obviously a dumb, fun kind of guy. It's pretty bare bones as games go too... as far as I can tell, there are twenty fighters to begin with and no more to unlock, although there's a choice of arcade and story modes. I certainly wouldn't recommend this if you're the type of person that buys top of the range Hori fighting sticks for serious fighting, but if you just fancy some stupid comic book fighting, Mortal Kombat vs DC Universe will fit the bill quite nicely.